Warning - this is a long post. I'm very excited to say that I received 21 AWESOME frankenpolishes for my contest. Seriously ladies, I can't believe that I got that many entries, especially as the prize was only a single lonely polish (albeit a very special one). The winner of the people's choice (i.e. the frankenpolish that receives the most votes) will receive the bottle of Sally Hansen Turquoise Opal. AND...because of the number of entries, and because they are all so fantastic, there is going to be an additional prize awarded by a panel of judges. The judges being my husband and my mum. The judges choice will receive a brand new bottle of Nfu Oh #123. I have two bottles. 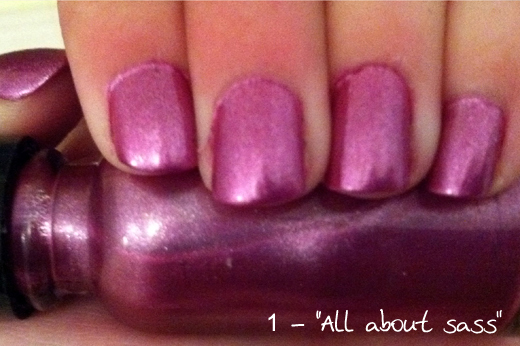 I haven't swatched mine on it's own yet, but you can see some great swatches on The NailPhile. A note to all the entrants. I have re-sized and oriented all photos to be a consistent size and angle. If you submitted multiple photos, I selected the one I thought represented your polish the best. Polishes are display in alphabetical order based on the names you gave them. This post took me AGES to prepare, so if you see an error, please let me know. Good Luck. A note to people voting. Most of these entrants said this was only their first or second attempt at doing a frankenpolish. You will see that they used a large variety of ingredients to create their frankens, such as other polishes, glitters, eye shadows and pigments. I think they have all done an amazing job. We should all totally work for a nail polish company and design their next collection! Recipe - "a whole bottle of Maybelline Mini Colorama in 27 Fruit Roll Up [it's those mini bottles so 7.5ml], half a bottle of Maybelline Mini Colorama in 67 Wonder Violet [again a mini bottle] and a quarter of a bottle of Face of Australia Molten Metallics in Titanium"
She says "As the photo shows it's a metallic pink/purple which catches the light and makes me smile every time I see it"
Recipe -"1\4 bottle of Beauty Care 60, 3 drops from Jade 373, 5-6 drops from Pro. Beauty 50, 3 drops from Sally Hansen 26, 8 drops from Color Club's Wicked Sweet, 8 drops from Golden Rose 52, 9 drops from Revlon's Gum drop, 3 drops from Top Beauty 148, 2 drops from Top Beauty 88, 6 drops from Orly's Orly Platinum, 9 drops from Top Beauty 204, 10 drops from Jade 392, 3 drops from Jade 398, 4 drops from Top Beauty 245, 12 drops from Chic 104, 5 drops from Sally Hansen 180 and 8 drops from Wow Cosmetics 404." 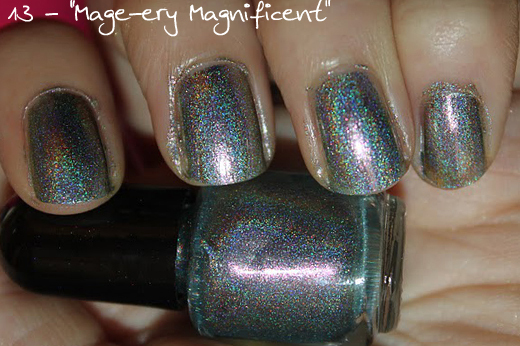 She says " I wanted to show a little how beautiful is the holo effect is". Recipe - "approximately 1/4 clear, 1/4 AC-NED-78 (a sheer peachy orange chunky glitter), 1/4 China Glaze Ravishing Dahling, 1/8 AC-NED-09 (yellow creme), 1/8 Cover Girl Boundless Color Crystal Mist and 1/3 tsp fine blue glitter". She says "I wanted a red jelly glitter and this seems to have worked out perfect! The chunky prismatic glitter of the AC along with the multichrome glitter of the Cover Girl shows really well in the depths of the jelly. 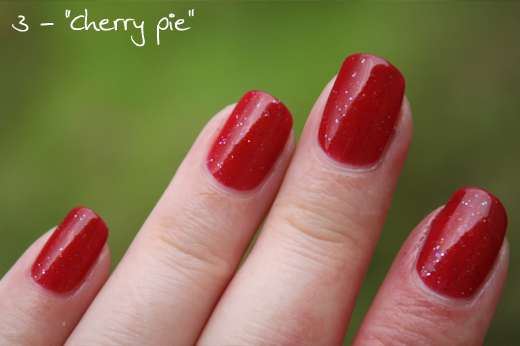 I decided to name this Cherry Pie as the color of the red jelly reminded me of cherry pie filling". Recipe - "Nina Ultra Pro Sweet Nothings, American Apparel Dynasty, OPI Glow Up Already, Milani Gems, Wet n Wild Party of Five Glitters, Sinful Colors Frenzy, clear polish"
Recipe - "Wet n Wild Carribbean Forest plus a touch of Wet n Wild Black Creme." She says "I was trying to slightly darken Caribbean Forest, but it turned into something completely unexpected. 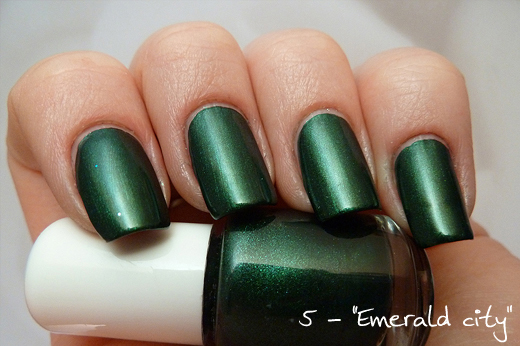 What I got is an amazing deep emerald green that I fell in love with." Recipe - "1/2 L.A. Girl Flare Clear/Silver, 1/4 Sally Hansen Blue Me Away, 1/8 Sinful Colors Scandal, 1/8 L.A. 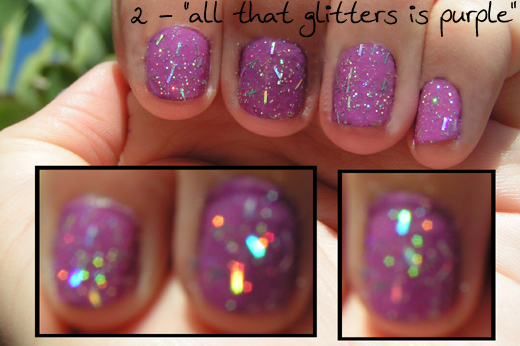 Girl Burgundy"
She says "It is a pretty blue color with holo glitter particles. The holo is much more visible in real life. In the pictures it showed up pretty much just silver, but it actually looks more like the glitter in the bottle. " Recipe - "Half a bottle of The Color Workshop a blue-toned purple metallic (unnamed), 40 drops of Sally Hansen Must-Have Iris, 1/2 bottle of Sally Hansen Xtreme Wear in Lime Lights, 30 drops of Sephora by OPI Gleek Out, 1/3 bottle of a warm gold Stripe Rite polish, 20 drops of OPI Ink, 15 pinches of a fuchsia shimmer eyeshadow from the Color Workshop, 5 pinches of a light pink blush from the Color Workshop"
She says "Frankenberry a purple shimmer/metallic with a subtle silver/green sheen and gold, pink, and green microglitter. I wanted a polish that combined my two favorite colors - green and purple - and that would sparkle without being over-the-top. The picture also features my favorite stuffed animal in coordinating colors! The color is very unique and will flatter all skintones; this icy purple still looks great on my warm skin.". 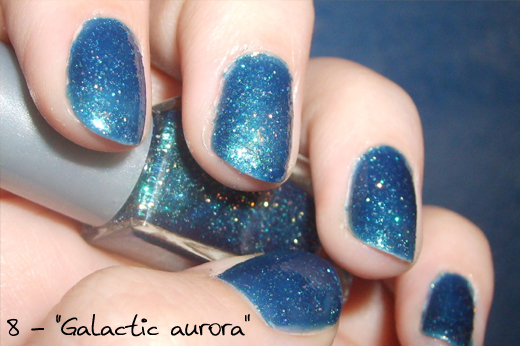 Recipe - " 3/4 bottle unnamed Target mini polish (clear irridescent glitter in a clear base), 15 drops Wet n Wild Blue Moon, 5 drops Wet n Wild Caribbean Frost"
She says "I was going for a night sky with a little bit of northern lights, but when I got it on and took pictures, it looked almost otherworldly! Hence, Galactic Aurora." Recipe - "This contains mostly China Glaze polishes: mostly Bermuda Breakaway and Grape Pop; a bit of Tempest, Eyes Like Sapphires, and Flying Dragon to tweak the color; and a tiny bit of Moonlight to make it a bit more jelly. 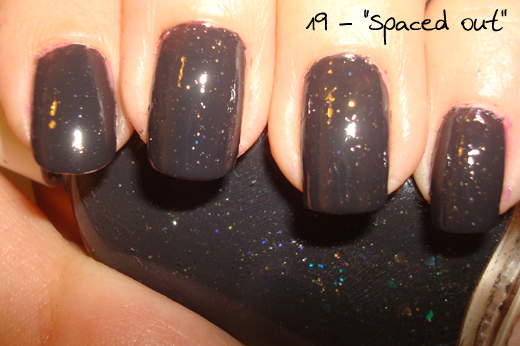 It also has SpectraFlair silver pigment ... for the magic holo." Recipe - "third a bottle of N.Y.C. 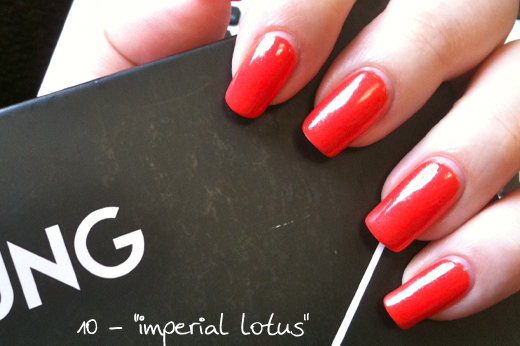 's "Tangerine Creme", a third of a bottle of Sinful Color's "Let's Meet", a third of a bottle of Color Club's "Spellbound" and three drops of China Glaze's "Phat Santa""
She says "This is a bright orange with golden shimmer. The shimmer is subtle but definitely noticeable in the sun. I think this is as close as I can get to MAC's "Imperial Flower" without actually being it!" Recipe - "roughly 3 parts Pure Ice Purple Reign + 1 part Wet n Wild Nocturnal"
She says "I created Kashmir after seeing swatches of Sally Hansen Arabian Night. I don't know how close this is to the original, but I don't care anyway, because it's beautiful as is. I name all my frankens for songs/music, and between the original name and my polishes used, this Led Zeppelin song seemed a perfect fit." Recipe - "1/2 essence "just rock it!" (dark blue), and then added some drops of Nfu.OH 65 and China Glaze "Sexagon" 'til I liked the holo effect"
She says "I created this, because i wanted the discontinued OPI DS "Glamour" and thought this would be pretty simple to create"
Recipe - "Hard Candy Beetle and spectraflair holo pigment, probably about a 1/4-1/2 tsp"
Recipe - "Base was Laser Lime by China Glaze (1/2 bottle), Interference Green by PearlEX powder (1/6 teaspoon), Mink by PearlEX powder (1/8 teaspoon), He's going in circles by China Glaze (1/6 teaspoon)"
She says "I would describe this polish as a lighter cousin of DS Illuminate by OPI. 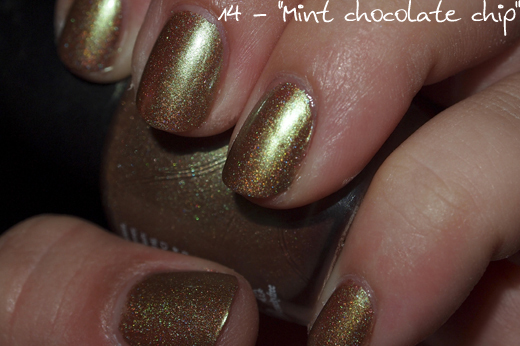 It is a light to medium brown with green shimmer duochorme, and holo micro glitter. " Recipe - "1/2 Bottle of Ulta Sun-Sational, 3/4 Bottle of a random mini OPI red (sorry - have no idea of the name - any red colour will do! ), 1/6 Bottle of Color Club Turn The Other Chic, A couple drops of China Glaze White Cap, A couple drops of China Glaze White Out"
She says "The sparkle on the polish alone does not photograph too well.. It is more noticeable in person.. Orange is a summer colour and, in my opinion, the colour of this particular summer. I think it is very fun and easy to make.. 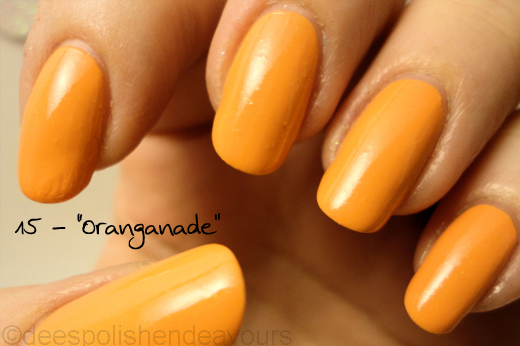 Especially if you're not one to own a full bottle of orange polish (as it can be.. scary?) you can just mix some up when needed!" Recipe - "unnamed Sally Girl pink glitter, Wet n Wild Tickled Pink, and Cover Girl City Lights"
She says "I've named it pink-182, after my favorite band, blink-182 The holo glitter was an afterthought - and I'm happy that I thought of it!" 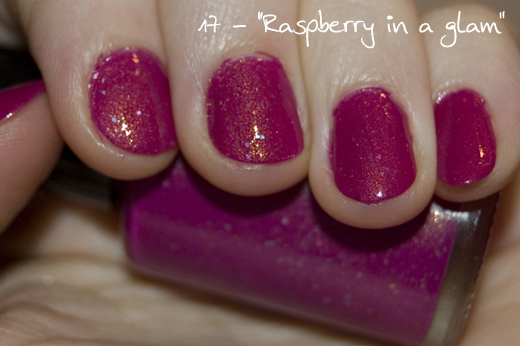 Recipe - "Roughly equal parts Zoya Charisma, Sinful Colors Pinky Glitter and Morph Sheer, Rimmel London Torrid"
She says "We pick berries in late summer to turn into jam and the color of this reminded me of the raspberry jam we make. This raspberry is glammed up rather that jammed up though ;)"
Recipe - "About the same amount of each of - China Glaze - Gold Digger, China Glaze - Strawberry Fields, Orly - Galaxy Girl, OPI - Last Friday Night, H&M - Blue Wave, Essence - Choose Me!, Deborah Milano - 838, Paris Memories - 253, Paris Memories - 254, Diamond Cosmetics - Turquoise Glitter and LA Girl - Overdose"
She says "The polish is a blend of many different glitter and shimmer polishes. 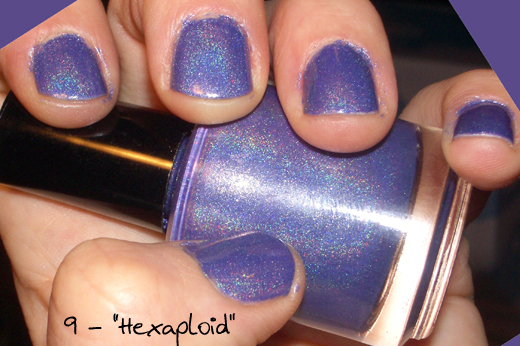 The result is a blue-toned purple base filled with silver, gold, blue, purple and iridescent glitter/shimmer in different sizes. My franken is called Smells Like Teen Spirit, which is named after the song from one of my all-time favorite bands Nirvana, as a tribute"
Recipe - "1/4 clear, 1/4 white, 3 drops of black, 1/2 California (no name), gold and purple glitter"
She says "I made this on whim because I didn't like the California that much and it was super cheap so I played around and the color started to remind me of space so I added gold glitter for stars and purple because I thought it would look cool. So the name came about because I made this while spaced out and it looks like space :D"
Recipe - "Clear pink glitter nail polish and eyeshadow sample"
She says "The eyeshadow sample I used in this nail polish is a lovely peachy/coral colour with a bit of gold tinge.I dont normally wear anything red in colour on my face so i thought this would be a great coral colour for my nail polish collection. 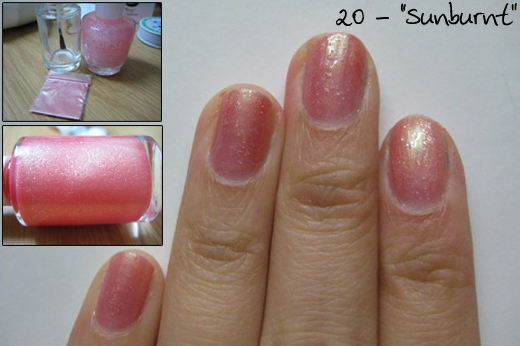 The bottle of pink glitter polish i have used with this eyeshadow colour is a transparent glitter polish. (fairly colourless) It has turned out great with the jelly coral sunburnt colour with a bit of glitter"
Recipe - "Approximately 1/20 A green unknown glitter, 1/20 Orly Royal Navy, 1/20 H&M Envy Me, 1/20 Gosh Effect Powder (no label with name), 2/20 L.A. Colors Color Craze Treasure Island, 2/20 Gosh Vanilla Ice, 2/20 Gosh Snow, 4/20 Gosh Yellow Doll, 6/20 H&M U Must Have This"
She says "The franken is called: Vandhund. Directly translated it's 'Water Dog' but it's a danish expression that describes a person who loves to swim and play in water - kind of like a dog for water :) And that was my inspiration for this franken. I wanted to do a summer-y franken and I thought about beaches right away and how I love swimming and playing in water - I AM a 'vandhund'! 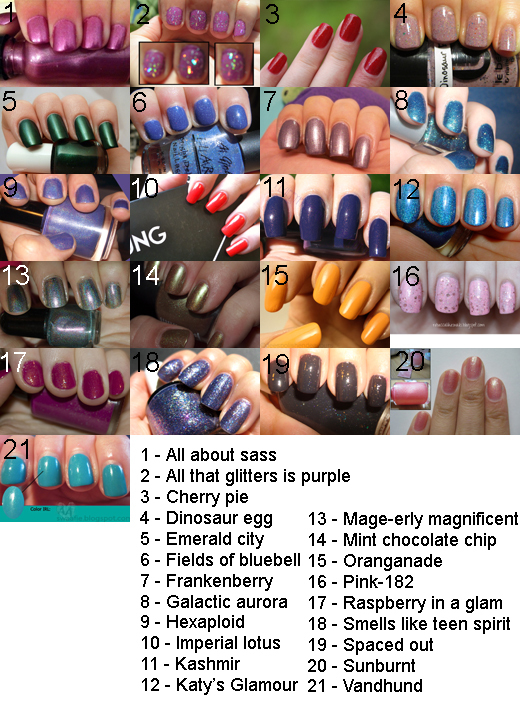 It's not the most complex polish, but I love it :)"
So there you have it, all 21 entries. Now time to VOTE. Of course you can vote for yourself. Follower names will be checked to make sure they are real. Please complete the form to cast your vote. Minimum total votes 50. If I don't get 50 total votes by the closing date, voting will remain open until we get 50 votes (total, not for one polish). Here is a quick reminder of everything you have seen. Voting form removed. Voting Closed. I have totally loved doing this contest, so much so, that in future I will only be doing contests rather than giveaways. I would much rather reward the people that make an effort, rather than having 500+ entries to a giveaway, some of which follow, then un-follow if they didn't win. So once again THANK YOU to the people who entered, and THANK YOU to you if you made the effort to vote. Someone will appreciate you for it. One final note on prizes. I would seriously love to give away numerous bottles in a prize, however, shipping nail polish internationally is rather a PITA for Australians. Because of Australia Posts' Dangerous goods regulations we are not suppose to ship polish unless you secure a dangerous goods contract with Australia Post. We have to provide photo ID, which is recorded, when sending parcels overseas. I know a fellow Aussie blogger who was fined by Australia Post for shipping polish overseas!! I have found that if I just ship one or two bottles I've been ok. So fingers crossed and please don't dob me in to the authorities, or there will be no more international contests. Damn that was a long post - it's gonna take me a while to recover from this one! I totally agree with you that a contest is so much more exciting than a straight up giveaway! I love all of these polishes! in hindsight i think i used the worst photo of my polish lol. i posted more on my blog in case anyone would like to see! i didn't even vote for my own... Jane's was too awesome. Even though we could only choose one I loved #10, #11, #12 and #15! Wow, it was really hard to pick just one! So many of these were extremely great! Oh I would totally love to win the judges pick!!! I dont have a single Nfu Oh. Thanks for the great contest. They are too great! I have 3 favorites now, I just can't decide. I'd buy them in a heartbeat if I saw them in a store! What a great idea :) I've never made a franken but now I want to! Good luck to all that entered!! This was really fun and I would look forward to more of these contest! Whoa, everybody did such a great job!!! this is so awesome...i love them all...wish had i known soon enough to enter...good luck yall!!! What great entries and how hard is it to have to choose only one!? I loved reading what each of you had to say about how your Franken came into being. You are all winners no matter how the winner is voted. Not sure, but I might have voted twice because when I voted the 1st time and click 'submit' it went to a whole other blank screen. I thought it was odd so I voted again (just in case) this time it gave me the "Thank you" message. I just thought I'd tell you just in case. 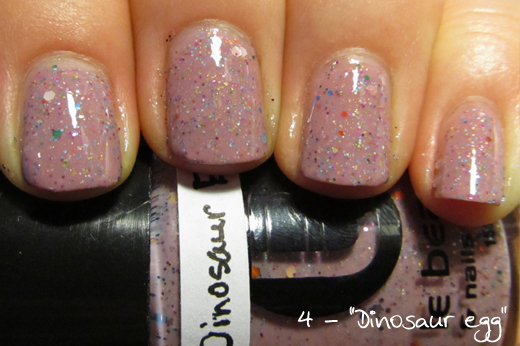 My vote is for #4, Dinosaur Egg, from Zara!! GOOD LUCK to all the entrants, they are all phenomenal!